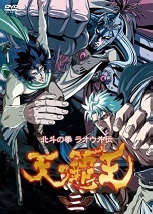 Hokuto no Ken Raoh Gaiden: Ten no Haoh (Fist of the North Star Raoh Side-story: The Conqueror of the Heavens) is a 13 episode anime series which was originally broadcast in Japan in late 2008. The series is an adaption of Youkow Osada's manga, which had been published over a year earlier. The series stars Raoh, master of Hokuto Shinken, and shows his rise to power. 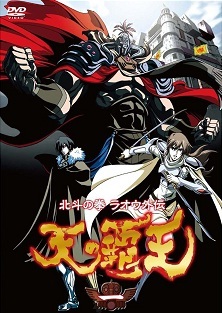 With the help of Reina and Souga, Raoh starts his quest to become the conqueror and bring everything under his control. 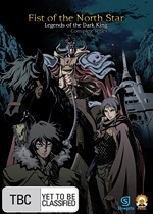 Ten no Haoh has been released in America on both DVD and Blu-Ray via Sentai Filmworks, who released it under the name of Legends of the Dark King: A Fist of the North Star Story. My Fists are for the Heavens! No Castle Can Stand Against Me! These Fists are for Other People! The Blue Wolf Tears Across The Earth! Wailing Resounds Through the Darkness! Fists Smashed in Hot Sand! I Walk the Path of the Heavens! The series was released in America in 2009, and several sites gave reviews for it. "So is it the worst series ever made? Probably not. Fist (of the North Star) for one has it beat in both visual shoddiness and sheer epic crap factor. But it's close. Dark Kings is one of the few, the proud, the genuinely awful. Don't take that wrong; in an era of aggressive mediocrity, to say that something is actively, nay painfully bad is actually a sort of backhanded compliment. At the very least when you finish you'll remember it, if only in the way that, even with memories suppressed, torture victims still remember being tortured." 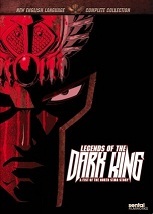 "At 13 episodes, Legend of the Dark King is an ideal entry point into the Fist of the North Star series for the uninitiated. Decent quality animation, good narrative pacing." "This is decently-made violent action anime of the kind that we couldn't get enough of back in the '90s. Nowadays, it's a little one-dimensional compared to most of the better Japanese animation offerings out there. For those who enjoy its particular dimension, though, Raoh's adventures deliver as advertised. After all, it would break his code to do anything but." For the most part, the reviews were mildly positive, recommending the series as a starting point for anyone new to the franchise. Carl Kimlinger's extremely negative review didn't just pick faults with the series, but with the entire Fist of the North Star franchise itself, something the fandom was quick to criticize him on. Whilst I haven't got any information on Japanese reviews, the series was apparently getting good viewer ratings every time an episode aired. -Sakuya is not present at all, she only appears in the anime. -There are a couple of chapters the anime didn't adapt, including a story with Jagi in it, and another one featuring Amiba. I'm not sure what happens in the Amiba one, but the Jagi one involves him getting into a fight with Souga and Reina, only to back down when he realises that the pair are working for Raoh. -The fight between Raoh and Souther is much shorter. In September 2008, a special two part chapter was released. This was a tie in to the anime series, which started to air a month later. I don't know much about it other than I know Sakuya does make an appearance. The broadcast version of Ten no Haoh was heavily censored, such as blurring out decapitations and removing blood. The violence censorship was wildly inconsistent, as sometimes blood would be removed, but other times it wouldn't. When the DVDs were released, there was no censorship. However, this wasn't the only difference. Many shots were altered, changing the looks of characters and backgrounds, and fixing errors. Take a look at the "DVD differences" pages on the episode links above to find out more. In Japan, Ten no Haoh was released over a quite frankly ridiculous series of 6 DVDs, each one containing just a couple of episodes. Sentai Filmworks have released the series several times in America. The first DVD release contains all 13 episodes on a 2 disc set, with a small behind the scenes feature and clean versions of the intro and credits sequences. An updated version of the set adds an English dub track, and this version of the series is also available on Blu-ray. In Australia, the series has been released on DVD via Siren Visual Entertainment.